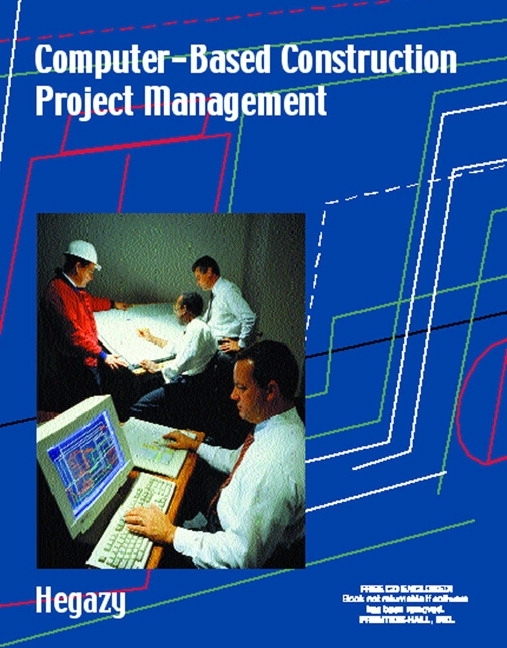 Hegazy, T. "Computer-Based Construction Project Management," 2002, Prentice Hall. Hegazy, T. and Abdel-Monem, M. (2012) “Email-Based System for Documenting Construction As-Built Details,” Journal of Automation in Construction, Accepted March 2012, 30 pages.Hegazy, T. and Menesi, W. (2012) “Heuristic Method for Satisfying Both Deadlines and Resource Constraints," Accepted Sept.1, 2011, 23 Pages, Jr. of Construction Engineering and Management, ASCE. Hegazy, T., and Menesi, W."Enhancing the Critical Path Segments Scheduling Technique for Project Control,” Canadian Journal of Civil Engineering, CSCE, 28 pages, Accepted Oct. 2011. Hegazy, T., Elhakeem, A., Ahluwalia, S.S., and Attalla, M. (2012) MOST-FIT: Support Techniques for Inspection and Life Cycle Optimization in Building Asset Management,” Journal of Computer-Aided Civil and Infrastructure Engineering, Vol. 27, pp. 130-142. Hegazy, T., Said, Mohamed, and Kassab, A., (2011) “Schedule Analysis for Construction Rework Mitigation," Journal of Automation in Construction, Vol. 20, pp. 1051-1059. Hegazy, T., Ali, Abdelbaset, and Abdel-Monem, M. (2011) “Prospects of Mind Maps for Better Visualization of Infrastructure Literature," Jr. of Professional issues in Engineering & Education, ASCE, 137(4), 239-247. Hegazy, T. and Elhakeem, A. (2011) “Multiple Optimization and Segmentation Technique (MOST) for Large-Scale Bilevel Life Cycle Optimization,” Canadian Journal of Civil Engineers, Vol. 38, pp. 263–271. Yousefi, S., Hipel, K., and Hegazy, T. (2010) “Optimum Compromise among Environmental Dispute Issues Using Attitude-Based Negotiation,” Canadian Journal of Civil Engineering, 38(2) 184-190. Shipra Singh Ahluwali and Tarek Hegazy (2010) “Roof Deterioration and Impact: A Questionnaire Survey,” Journal of Retail and Leisure Property, Vol. 9, No. 4, pp. 337-348. Yousefi, S., Hipel, K.W., and Hegazy, T. (2010) “Attitude-Based Strategic Negotiation for Conflict Management in Construction Projects,” Project Management Journal, PMI, 41(4), 99-107. Hegazy, T., and Menesi, W. (2010) "Critical Path Segments (CPS) scheduling technique." Journal of Construction Engineering and Management, ASCE, 136 (10), 1078-1085. Hipel, K.W., Hegazy, T., and Yousefi, S. (2010) “Combined Strategic and Tactical Negotiation Methodology for Resolving Complex Brownfield Conflicts,”. Journal “Pesquisa Operacional”, Special issue on “Soft OR and Complex Societal Problems”,30(2), pp. 281-304. Elhakeem, A., Hosny, O., Hegazy, T. and EL-Mikawi,M. (2010) “A Custom Building Deterioration Model,” Journal of Structural Engineering and Mechanics, Computational Structural Engineering Institute of Korea., Techno-Press, South Korea, Vol. 37 (6), pp 685-691. Saied Yousefi, Keith Hipel, and Tarek Hegazy (2010) “Considering Attitudes in Strategic Negotiation over Bownfield Disputes,” Journal of Legal Affairs and Dispute Resolution in Engineering and Construction, ASCE, 2(4), pp.240-247. Kassab, A., Hegazy, T. and Hipel, K. (2010) “Computerized DSS for Construction Conflict Resolution under Uncertainty," Journal of Construction Engineering and Management, ASCE, 136(12), 1249-1257. Elhakeem, A., and Hegazy, T. (2010) “Building Asset Management with Deficiency Tracking and Integrated Life Cycle Optimization,” Jr. of Structure and Infrastructure Engineering, 1744-8980. Hegazy, T., Ahluwalia, S.S., and Attalla, M., (2010) “Two Condition Indicators for Building Components based on Reactive-Maintenance Data,” Journal of Facilities Management, Vol. 8, No. 1, pp. 64-74. Saied Yousefi, Keith W. Hipel, and Tarek Hegazy (2010) “Attitude-Based Negotiation Methodology for the Management of Construction Disputes,” Jr. of Management in Engineering, ASCE, Vol. 26, No. 3, 114-122. Moustafa Kassab, Keith Hipel and Tarek Hegazy (2009) Multi-Criteria Decision Analysis for Infrastructure Privatization using Conflict Resolution, Jr. of Structure and Infrastructure Engineering, Vol. 5, No. 2. Elbehairy, H., Hegazy, T. and Soudki, K. (2009) “Integrated Multiple-Element Bridge Management System,” Journal of Bridge Engineering, ASCE, Vol. 14, No. 3, pp. 179-187. Hegazy, T. and Menesi, W. (2008) ”Delay Analysis Under Multiple Baseline Updates,”, Journal of Construction Engineering and Management, ASCE, Vol. 134, No. 8, pp. 575-582. Hegazy, T. and Kamarah, E. (2008) “Efficient Repetitive Scheduling for High-Rise Construction,” Journal of Construction Engineering and Management, ASCE, Vol. 134, No. 4, pp. 253-264. Yousefi, S. Hegazy, T., Capuruco, R. and Attalla, M. (2008) "A System of Multiple ANNS For Online Planning of Numerous Building Improvements," Journal of Construction Engineering and Management, ASCE, Vol. 134, No. 5, pp. 342-351. Hegazy, T. (2006) "Simplified Project Management for Construction Practitioners,” Cost Engineering Journal, AACE International, vol. 48, No. 11, pp. 20-28. Elbehairy, H., Elbeltagi, E., Hegazy, T., and Soudki, K. (2006) "Comparison of Two Evolutionary Algorithms for LCC Optimization of Bridge Deck Repairs," Journal of Computer-Aided Civil and Infrastructure Systems, Blackwell Publishing, vol. 21, pp. 561-572. Kassab, A., Hipel, K., and Hegazy, T. "Conflict Resolution in Construction Disputes using the Graph Model," Journal of Construction Engineering and Management, ASCE, Vol. 132, No. 10, pp. 1043-1052. Hegazy, T. (2006) “A Computerized System for Efficient Delivery of Infrastructure MR&R Programs,” Journal of Construction Engineering and Management, ASCE, Vo. 132, No. 1, pp. 26-34. Elbeltagi, E., Hegazy, T., and Grierson, D. (2007) "Modifed Shuffled Frog Leaping Algorithm," Journal of Structure and Infrastructure Engineering, Vol 3, No. 1, pp. 53-60. Elbeltagi, E., Hegazy, T., and Grierson, D. (2005) "Comparison Among Five Evolutionary-Based Optimization Algorithms," Journal of Advanced Engineering Informatics, Vol. 19, pp. 43-53. Mbabazi, A., Hegazy, T. , and Saccomanno, F. (2005) “MBF: Modified But-For Method for Delay Analysis,” Journal of Construction Engineering and Management, ASCE, Vol. 131, No. 10, pp. 1142-1144. Capuruço, R., Hegazy, T., Tighe, S., and Zaghloul, S. (2005) "Full-Car Roughness Index as Summary Roughness Statistic," Transportation Research Record, TRB, No. 1905, pp. 148-156. Hegazy, T. (2005) "Computerized System for Efficient Scheduling of Highway Construction," Transportation Research Record, TRB, No. 1907, pp. 8-14. Hegazy, T., Elbeltagi, E., and Zhang, K. (2005) “Keeping Better Site Records Using Intelligent Bar Charts,” Journal of Construction Engineering and Management, ASCE, Vol. 131, No. 5, pp. 513-521. Hegazy, T. and Zhang, K. (2005) “Daily Windows Delay Analysis,” Journal of Construction Engineering and Management, ASCE, Vo. 131, No. 5, pp. 505-512. Hegazy, T. and Zhang, K. “Construction Delay Analysis Using A Daily Windows Approach,” Accepted, Journal of Construction Engineering and Management ASCE. Elhakeem, A. and Hegazy, T. “A Graphical Approach for Manpower Planning in Infrastructure Networks,” Journal of Construction Engineering and Management, ASCE. Hegazy, T., Elbeltagi, E., and Zhang, K. “Keeping Better Site Records Using Intelligent Bar Charts,” Accepted, Journal of Construction Engineering and Management, ASCE. Elbeltagi, E., Hegazy, T., and Eldosouki, A. "Dynamic Layout Planning to Improve Safety on Construction Sites,” Accepted, Journal of Construction Engineering and Management, ASCE. Attalla, M., Hegazy, T. ., and Elbeltagi, E. “In-House Delivery of Multi-Small Reconstruction Projects: The Resource Optimization Challenge,” Accepted, Jr. of Mgmt. in Engrg., ASCE. Attalla, M., Hegazy, T. (2003) “Predicting Cost Deviation in Reconstruction Projects: ANN vs Regression,” Journal of Construction Engineering and Management, ASCE, Vol. 129, No. 5. Attalla, M., Hegazy, T., and Haas, R. (2003) “Reconstruction of the Building Infrastructure: Two Performance Prediction Models,” Jr. of Infrastructure Systems, ASCE, 9(1), 26-34. Hegazy, T., and Petzold, K. (2003) "Genetic Optimization for Dynamic Project Control," Journal of Construction Engineering and Management, ASCE, Vol. 129, No. 5. Attalla, M., Hegazy, T. (2003) “Success of Reconstruction Projects: A Statistical Investigation,” Cost Engineering International, AACE. Hegazy, T., Elhakeem, A., and Elbeltagi, E. “Distributed Scheduling Model for Infrastructure Networks,” Accepted Nov. 2002, Jr. of Construction Engineering and Management, ASCE. Hegazy, T. and Kassab, M. “Resource Optimization Using Combined Simulation and Genetic Algorithms,” Accepted Oct. 2002, Jr. of Construction Engineering and Management, ASCE. Hegazy, T. (2001) "Critical Path Method-Line of Balance Model for Efficient Scheduling of Repetitive Construction Projects,” Transportation Research Record, No. 1761, pp. 124-129. Elbeltagi, E., Hegazy, T., Dosouki, A. and Hosny, A. (2001) "Schedule-Dependent Evolution of Site Layout Planning," Construction Management and Economics, 19(7), pp. 689-697. Hegazy, T. and Ersahin, T. (2001) “Simplified Spreadsheet Solutions: Subcontractor Information System,” Jr. of Constr. Engineering and Management, ASCE, 127(6), 461-468. Hegazy, T. and Ersahin, T. (2001) “Simplified Spreadsheet Solutions: Overall Schedule Optimization,” Jr. of Construction Engineering and Management, ASCE, 127(6), pp. 469-475. Hegazy, T. and Wassef, N. (2001) "Cost Optimization In Projects with Repetitive Non-Serial Activities,” Jr. of Construction Engineering and Management, ASCE, Vol. 127(3), 183-191. Hegazy, T., Zaneldin, E., Grierson, E. (2001) “Improving Design Coordination for Building Projects: I – Information Model” Jr. of Constr. Engrg. & Mgmt., ASCE, 127(4), 322-329. Zaneldin, E., Hegazy, T. and Grierson, E. (2001) “Improving Design Coordination for Building Projects: II – A Collaborative System,” Journal of Construction Engineering and Management, ASCE, Vol. 127, No. 4, pp. 330-336. Karray, F., Hegazy, T., Zaneldin, E., Shabeeb, A., Elbeltagi, E. (2000) "A Soft Computing-Based Tool for Facilities layout Planning," IEEE Trans. on Fuzzy Systems, 8(4), 367-379. McKim, R., Hegazy, T., and Attalla, M. (2000) "Project Performance Control in Reconstruction Projects" Jr. of Constr. Engrg. & Mgmt., ASCE, 126(2), pp. 137-141. Hegazy, T., and Elbeltagi, E. (2000) "Simplified Spreadsheet Solutions: Model for Site Layout Planning," Cost Engineering, AACE International, AACE, Vol. 42, No. 1, 24-30. Elbeltagi, E. and Hegazy, T., (2000) "A Hybrid AI-Based System for Site Layout Planning in Construction," Computer-Aided Civil and Infrastructure Engineering Jr., 15(6), pp.464-478. Hegazy, T., Shabeeb, A., El-Beltagi, E., and Cheema, T. (2000) "Algorithm for Scheduling with Multi-Skilled Constrained Resources," Jr. of Constr. Engrg. & Mgmt., ASCE, 126(4). Hegazy, T., Grierson, D., Ayed, A., and Zaneldin, E. (2000) "Resource Optimization in a Design Office using Simulation," Project management Journal, PMI, 31(4), pp. 33-43. Hegazy, T., (1999) "Optimization of Resource Allocation and Leveling Using Genetic Algorithms," Jr. of Constr. Engrg. & Mgmt., ASCE, 125(3), pp.167-175. Hegazy, T., and Ayed, A., (1999) "Simplified Spreadsheet Solutions: Models for CPM and TCT Analyses," Cost Engineering, AACE International, AACE, Vol. 41, No. 7, 26-33. Hegazy, T., and Ayed, A. "Simplified Spreadsheet Solutions: A Trainable Predictor," Paper Accepted for Publication in April 1999, Cost Engineering, AACE International, AACE. Hegazy, T. (1999) "Optimization of Construction Time-Cost Trade-Off Analysis using Genetic Algorithms," Canadian Journal of Civil Engineering, CSCE, Vol. 26, pp. 685-697. Hegazy, T., and Elbeltagi, E., (1999) "EvoSite: An Evolution-Based Model for Site Layout Planning," Journal of Computing in Civil Engineering, ASCE, Vol. 13, No. 3, pp.198-206. Hegazy, T. and El-Zamzamy, H., (1998) "Project Management Software that Meet the Challenge," Cost Engineering, AACE International, Vol. 4, No. 5, pp.25-33. Hegazy, T., Khalifa, J., and Zaneldin, E., (1998) "Towards Effective Design Coordination: A Questionnaire Survey," Canadian Journal of Civil Engineering, CSCE, Vol. 25, pp. 595-603. Hegazy, T., Tully, S., and Marzouk, H. (1998), "A Neural Network Approach for Predicting the Structural Behaviour of Concrete Slabs," Canadian Jr. of Civil Engineering, 25, 668-677. Hegazy T. and Ayed, A., (1998) "A Neural Network Model for Parametric Cost Estimation of Highway Projects," Jr. of Construction Engineering & Management, ASCE, 24(3), 210-218. Hegazy, T., Rashedi, R., Ali, A. (2012) “GA+Segmentation for Large-Scale Asset Renewal Optimization,” 3rd. International Multi-Conference on Complexity, Informatics and Cybernetics (IMCIC 2012), to be held in Orlando, USA, on March 25th - 28th, 2012. Accepted Dec. 2011. Hegazy, T., Rashedi, R., Ali, A. (2012) “Efficient Heuristic Approach for Near-Optimum Allocation of Pavement Rehabilitation Funds," 3rd. International Multi-Conference on Complexity, Informatics and Cybernetics (IMCIC 2012), to be held in Orlando, USA, on March 25th - 28th, 2012. Accepted Dec. 2011. Abdel-Monem, M. Hegazy, T., Saad, D.A. (2012) “Automated System for Documenting the Evolution of As-Built Details During Construction," 2012 TRB Annual Meeting, TRB, Washington DC. Wail Menesi and Tarek Hegazy (2011) “Why CPS is better than CPM?,” CSCE Annual Conf., CSCE, Ottawa. Tarek Hegazy and Mohamed Abdel-Monem (2011) “Simplified IT Tools for Site Information Tracking,” CSCE Annual Conf., CSCE, Ottawa. Tarek Hegazy and Mohamed Attalla (2010) “Innovative Techniques for Building Inspection and Optimum Allocation of Capital Renewal Funds,” 37th Annual AEAS Conference, Cairo, Egypt, Dec. 26-28. Yousefi, S., Hipel, K.W., and Hegazy, T. (2010) “Soft Systems Thinking Approach to Conflict Resolution in Brownfield Redevelopment,” Proceedings of the Tenth Symposium on Stochastic Hydraulics, Fifth International Conference on Water Resources and Environment Research, 5-7 July 2010, Quebec, Canada. Yousefi, S., Hipel, K.W., and Hegazy, T. (2010) “Attitude-Based Strategic Negotiation for Conflict Management in Construction Projects,” Proceedings of the 2010 PMI Research and Educational Conference, Washington DC, July 2010. Hegazy, T. (2010) “Visual Asset Management System for Capital Renewal of Buildings Considering Sustainability Aspects,” Proceedings of the 6th IECC Int. Engineering and Construction Conf. ASCE, Cairo Egypt, June 28-30. Kassab, M., Hegazy, T., and Hipel, K. (2010) “MCDA-Based Decision Support System for Infrastructure Outsourcing Assessment,” Water2010: Hydrology, Hydraulics and Water Resources in an Uncertain Environment, 5th International Conference on Water Resources and Environment Research. Emad Elbeltagi, Tarek Hegazy, Donald Grierson (2010) “A New Evolutionary Strategy for Pareto Multi-Objective Optimization,” Proceedings of the Seventh International Conference on Engineering Computational Technology, B.H.V. Topping, J.M. Adam, F.J. Pallares, R. Bru and M.L. Romero, (Editors), Civil-Comp Press, Stirlingshire, Scotland, Paper Ref. 19, Sep. 14-17, 2010, Valencia, Spain, 17 pages. KeithW. Hipel, Tarek Hegazy, and Saied Yousefi, (2009) “Attitude-Based Negotiation for Resolving Brownfield Disputes,” Proceedings of the International Conference on Group Decision and Negotiation at Toronto, Canada, July 2009. Elhakeem, A., Hosny, O., Hegazy, T. and EL-Mikawi,M. (2009) “A Custom Building Deterioration Model,” International Conference on Computational Design in Engineering, CODE2009, Seoul, South Korea, Nov. 3 to 6, Computational Structural Engineering Institute of Korea. Elhakeem A., Hosny, O., Hegazy, T. and El-Mikawi, M., (2009) "Infrastructure Deterioration Modeling between Generalization and Customization," ASCE Conf., Irvine, California, USA. Tarek Hegazy, Shipra Singh Ahluwalia, and Mohamed Attalla (2009) “Simplified Approach for Condition Prediction of Building Components Utilizing Preventive Maintenance Data,” CSCE Annual Conf., CSCE. Saied Yousefi, Tarek Hegazy, Keith W. Hipel, and Mohamed Attalla (2009) “Managing Construction Conflicts Using Attitude-Based Negotiation” CSCE Annual Conf., CSCE. Tarek Hegazy, Hatem Elbehairy, and Khaled Soudki (2009) “Multiple-Element Bridge Management System: A Case Study in Ontario” CSCE Annual Conf., CSCE. Hegazy, T. and Menesi, W. (2008) “Delay Analysis Considering Dynamic Resource Allocation and Multiple Baselines,” 2008 AACE Transactions, 52nd Annual Meeting, Toronto, Canada, June 29-July 2, AACE Int. Menesi, W. and Hegazy, T. (2008) “Five Needed Enhancements to the CPM for Construction Projects,” 1st Int. Construction Specialty Conf., Quebec City, June 10-13, CSCE. Hegazy, T. Attalla, M., Hayter, L., and Panny, S. (2008) “Ultra Mobile Computer System for Accurate and Speedy Inspection of Buildings,” 1st Int. Construction Specialty Conf., Quebec City, June 10-13, CSCE. Ahmed, M. and Hegazy, T. (2008) “Comparison among Indoor Location-Based Technologies for Construction and Infrastructure Applications,” 1st Int. Construction Specialty Conf., Quebec City, June 10-13, CSCE. Al-Bukhary, I., Ahluwalia, S.S., and Hegazy, T. (2008) “Multi-Level GIS-Based Reporting of Infrastructure Maintenance Data,” 1st Int. Construction Specialty Conf., Quebec City, June 10-13, CSCE. Berbash, K., Hegazy, T., and Haas, C. (2008) “Developing a New Metric to Assess Airport Security Systems,” 1st Int. Construction Specialty Conf., Quebec City, June 10-13, CSCE. Hegazy, T. and Menesi, W. (2007) ”Delay Analysis Under Multiple Baseline Updates,” 2007 AACE Transactions, Nashville, TN, July15-18, 2007, pp. CDR.19.1- CDR.19.8. Yousefi, S., Hipel, K., Hegazy, T., Witmer, J., and Gray, P. (2007) ”Negotiation Characteristics in Brownfield Redevelopment Projects," IEEE SMC 2007 Transactions, Systems Machines, and Cybernetics (SMC), IEEE Montreal, Oct. 07-10. Kassab, M., Hegazy, T., and Hipel, K. (2007) “Uncertainty Analysis in Construction Conflict Resolution Using the Info-Gap Theory,” IEEE SMC 2007 Transactions, Systems Machines, and Cybernetics (SMC), IEEE Montreal, Oct. 07-10. Kassab, M., Hegazy, T., and Hipel, K. (2007) “Multiple Criteria Decision Support for Infrastructure Privatization,” Proceedings of the ASCE Workshop on Computing in Civil Engineering, ASCE, Pittsburgh, PA, July 24-26, pp..
Yousefi, S., Hipel, K., Hegazy, T., Witmer, J., and Gray, P. (2007) ”Cooperative Brownfield Redevelopment for An Educational Institution,” Proceedings of the Group Decision and Negotiation 2007, Vo. 1, May 14-17, Montreal, InterNeg Research Centre, Concordia University, Montreal, Canada, pp. 101-103. Kassab, M., Hipel, K., and Hegazy, T. (2007) ”Decision Support Tool for Conflict Resolution in Construction Projects,” Proceedings of the Group Decision and Negotiation 2007, Vo. 1, May 14-17, Montreal, InterNeg Research Centre, Concordia University, Montreal, Canada, pp. 111-113. Hegazy, T. and Elbehairy, H. (2006) “Improving the Performance of Evolutionary Algorithms for Large Scale Optimization of Bridge Deck Repairs,” The Fifth International Conference on Engineering Computational Technology, Las Palmas de Gran Canaria, Spain, Sept. 12 -15, Civil-Comp Press, 2006. Elbehairy, H., Hegazy, T. and Soudki, K. (2006) “Bridge Management System with Practical Work Zone Planning,” Joint International Conference on Computing and Decision Making in Civil and Building Engineering, ASCE, Montreal, June 14-16. Ahluwalia, S. and Hegazy, T. (2006) “Pictorial Database for Building Diagnosis,” Joint International Conference on Computing & Decision Making in Civil & Building Engineering, ASCE, Montreal, June 14-16. Kassab, M., Hipel, K., and Hegazy, T. (2006) “DSS For Conflict Resolution in Construction,” Joint International Conference on Computing and Decision Making in Civil and Building Engineering, ASCE, Montreal, June 14-16. Hegazy, T. (2006) “Computer Game for Simplified Project Management Training,” 1st International Construction Specialty Conference, CSCE, Calgary, May 22-26. Hegazy, T. (2006) “Better Visualization for Multiple-Site Infrastructure Programs Using GIS,” International Conference on Advances in Engineering Structures, Mechanics, and Construction, May 14-17, 2006, University of Waterloo, Waterloo, Ontario, Canada. Hegazy, T. (2005) “GIS-Based System for Optimizing Infrastructure Maintenance Programs of Distributed Sites,” The 10th Int. Conf. on Civil, Structural & Environmental Engineering Computing, Rome, Italy, 30 August - 2 September 2005, CIVIL-COMP Press. Ahluwalia, S. and Hegazy, T. (2005) Towards a 3-D CAD System for Accurate Condition Assessment of the Building Infrastructure,” 1st Annual Inter-university Symposium on Infrastructure Management (AISIM), August 6, University of Waterloo. Elbehairy, H., Hegazy, T. and Soudki, K. (2005) “Helping Bridges Live Longer and Healthier,” 1st Annual Inter-university Symposium on Infrastructure Management (AISIM), August 6, University of Waterloo. Elhakeem, A. and Hegazy, T. (2005) “Raising the Bar for Educational Buildings,” 1st Annual Inter-university Symposium on Infrastructure Management (AISIM), August 6, University of Waterloo. Hegazy, T. and Elhakeem, A. (2002) "Efficient Resource Planning for Infrastructure Programs," Proc. of the 1st Int. Conf. On Constr. in the 21st Century, Miami , FL , 103-110. Hegazy, T. and Kassab, M. (2002) "Resource Optimization in a Design Office using GA-Based Simulation," Proc. of the 1st Int. Conf. On Constr. in the 21st Century, Miami , 655-662. Elbeltagi, E., and Hegazy, T. (2002) "Incorporating Safety into Construction Site Management," Proc. of the 1st Int. Conf. On Constr. in the 21st Century, Miami , FL , 261-268. Attalla, M., Hegazy, T. (2001) "Computerized Resource Optimization for Infrastructure Projects," FOESA Biannual Meeting, Cairo , Egypt . Hegazy, T. (2001) "Resource Planning for Infrastructure Networks," Proceedings of the 8th Annual Canadian Construction Research Forum, Kananaskis , AB. Hegazy, T. (2001) "CPM/LOB Model for Cost Optimization in Repetitive Projects," Proceedings of Annual Ain-Shams International Conference, Cairo , Egypt . Hegazy, T. (2001) "CPM/LOB Model for Efficient Scheduling of Repetitive Construction Projects," Proc. of the 80th Annual TRB Conf., Washington , D.C. , Paper No. 01-3291. Attalla, M., Hegazy, T. (2001) "In-House Versus Outside Contracting for Owner Organizations," 29th CSCE Annual Conference, Victoria , BC . Hegazy, T., and Petzold, K. (2001) "Combined Earned-Value and Critical Chain to Improve Project Control," 29th CSCE Annual Conference, Victoria , BC . Karray, F., Zaneldin, E., Hegazy, T., Shabeeb, A. and Elbeltagi, E. (2000) “Computational Intelligence Tools for Solving the Facilities Layout Planning Problem,” Proceedings of the 2000 American Control Conference, ACC 2000, June 28-30, Illinois , USA . Zaneldin, E. and Hegazy, T. (2000) "An Information Model to Facilitate the Management of Design Changes in Building Projects," 2000 NSF Design and Manufacturing Research Conference, Vancouver , Canada . Hegazy, T. and Ersahin, T. (2000) "A Spreadsheet Model for Scheduling Under Time, Cost, and Resource Constraints," 28th CSCE Annual Conf., London , Ontario , pp. 1-7. Attalla, M., Hegazy, T., and Penny, S. (2000) "Challenges in Managing Multi Small Reconstruction Projects," 2000 AACE Transactions, pp. PM.16.01-PM.16.07. Hegazy, T., Shabeeb, A., and Cheema, T. (2000) "Using Multi-Skilled Resources to Improve Construction Schedules," 28th CSCE Annual Conference, London , Ontario , pp. 145-149. Attalla, M., Hegazy, T., McKim, R., and Coppinger, F., (1999) "Success Factors in Reconstruction Projects,” Proc. of the 27th CSCE Annual Conf., Regina , 319-328. Elbeltagi, E., and Hegazy, T. (1999) "Genetic Optimization of Site Layout Planning,” 1999 AACE International Transactions, AACE, pp. IT.05.1-IT.05.8. Zaneldin, E., Hegazy, T., Grierson, D., and Ayed, A. (1998) "Quantifying Teamwork Benefits to Design Offices using Simulation,” Proc. of the 7th AIAA symposium on Multidisciplinary Analysis and Optimization, St. Louis, Missouri, paper No. AIAA-98-4946, pp. 1843-1852. Hegazy, T. and Zaneldin, E., (1998) "Flowchart-Based Simulation of Construction Operations,” 1988 AACE International Transactions, Cincinnati , Ohio , pp. IT/IM.08.01-06. Hegazy, T., (1998) "Improving Resource-Scheduling Heuristics Using Biased Activity Priorities,” Proceedings of the 26th CSCE Annual Conference, Halifax , pp. 139-147. Hegazy, T. , and Ayed, A., (1997) "ANN Approach for Effective Management of Highway Construction Cost Data," 1st European Conf. on Int. Mgmt. Systems, England , 215-222.